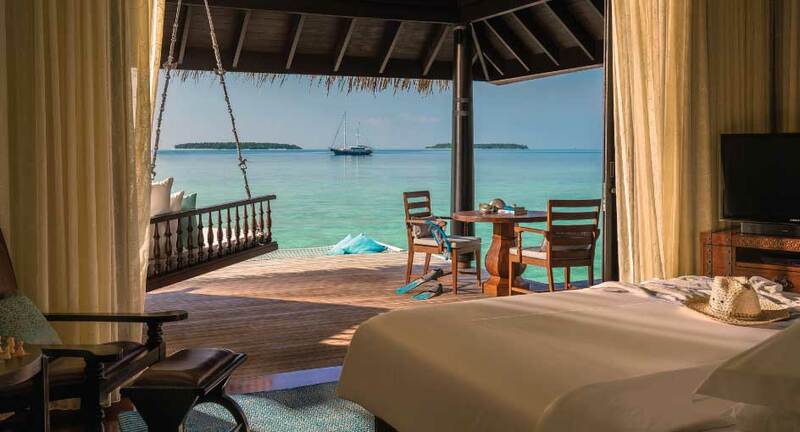 Nestled on the edge of Hanifaru Bay in the Maldives’ Baa Atoll island archipelago, Anantara Kihavah Maldives Villas is an idyllic slice of tropical heaven from which to explore the underwater world of the Indian Ocean. Set on one of the most pristine Maldivian islands, Kihavah Huravalhi, the luxurious resort is reached by a 30-minute seaplane flight from the Velana International Airport, which is an unforgettable experience in itself as the plane flies over palm-fringed islands with white sandy beaches and luxurious resorts, and the shimmering, turquoise ocean. 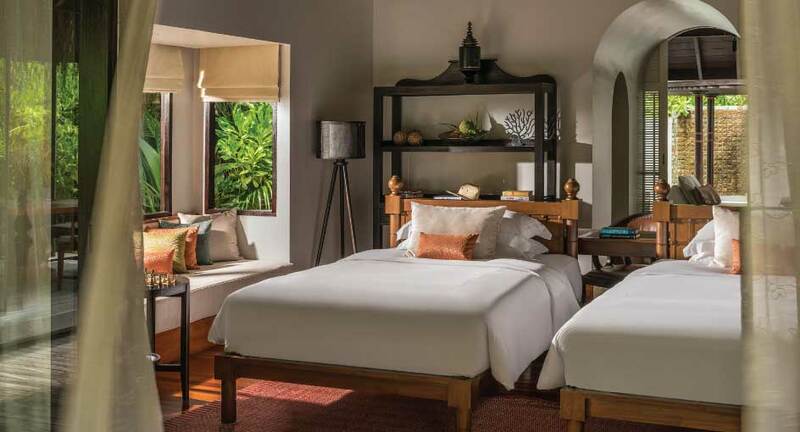 The luxury retreat features 80 spacious private pool villas nestled along a pristine stretch of private beach or poised over the water with private plunge pools and sweeping ocean views. Guests can choose from six exquisite dining and entertainment options, including an award-winning underwater restaurant and wine cellar and enjoy an array of deluxe amenities and activities from an exclusive spa, and yoga and meditation sessions to cooking classes, star-gazing, and elemental watersports. 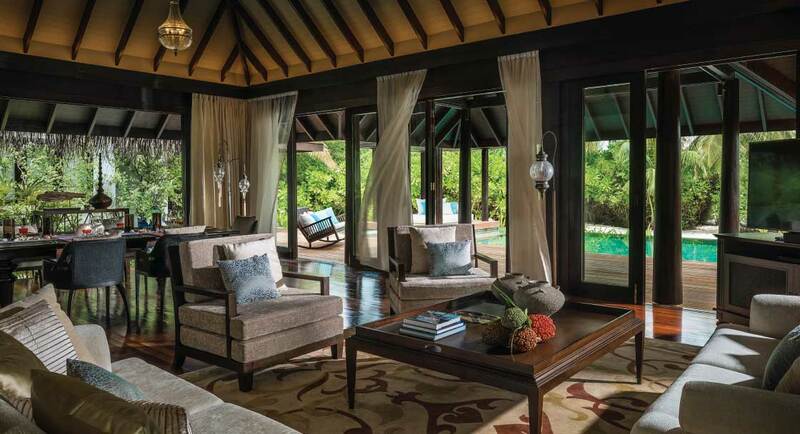 Naturally- inspired design seamlessly blends with the island charm in a variety of spectacular villas and residences at Anantara Kihavah Maldives Villas. 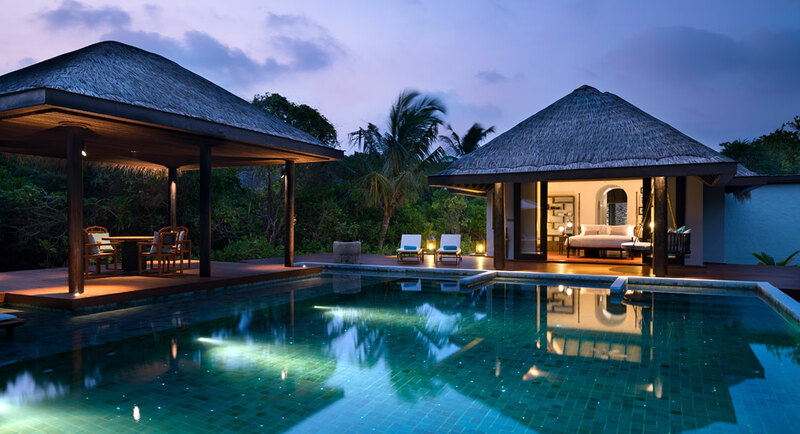 Villas range from between 258 and 412 square meters in size and are available on the beach or over the water with stunning ocean views, private swimming pools and sun decks, modern amenities, including complimentary wireless Internet, and a morning and evening turndown service. 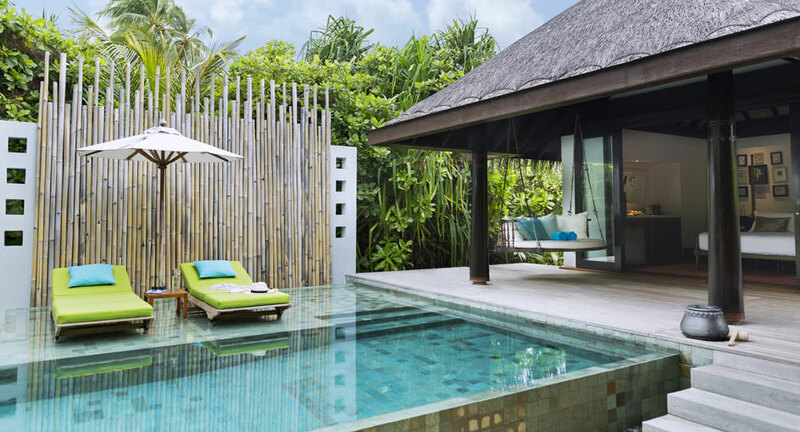 Set on the edge of the palm-fringed island, Beach Pool Villas offer a lavish home away from homes with 258 square meters of luxurious living spaces, dark wooden furnishings and deluxe Egyptian cotton, and en-suite bathrooms with indoor and outdoor showers, and outdoor bathtubs for two. Private sun decks with infinity swimming pools provide the perfect spot for sipping sundowners, and a 24-hour Villa Host takes care of every need. 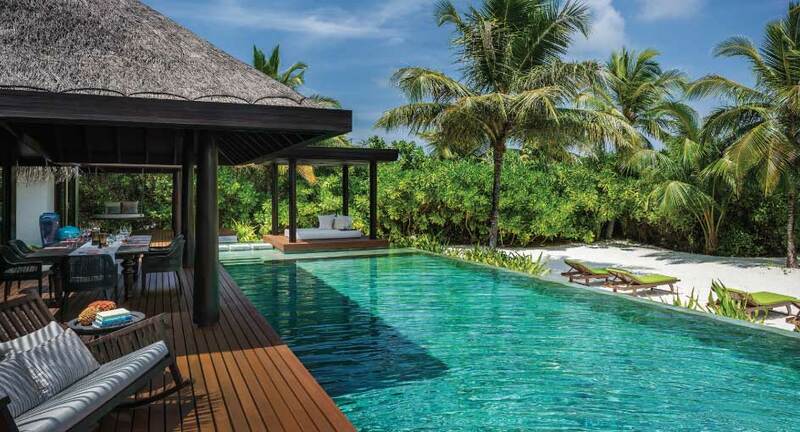 With indulgent touches of island beauty, Deluxe Beach Pool Villas boast 382 square meters of space with expansive outdoor decks with hammocks and sun loungers, infinity swimming pools with floating loungers, and open plan living spaces that seamlessly merge interiors with the outside. Bedrooms have his-and-hers walk-in dressing rooms and beautiful en-suite bathrooms with indoor and outdoor showers, and outdoor soaking tubs and state-of-the-art conveniences include Bose Bluetooth surround-sound systems and iPads. 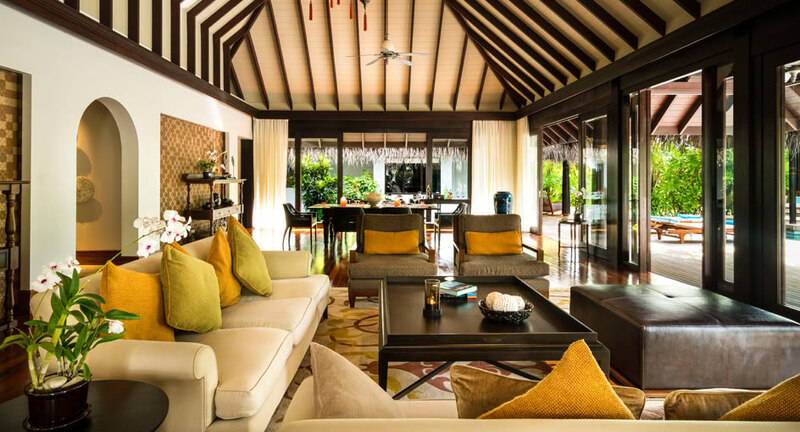 Sunset Beach Pool Villas are spacious hideaways offering stylish décor, modern conveniences, and special touches. Featuring 258 square meters of space, these beautifully appointed villas have elegant décor with splashes of color, beautiful sundecks with swing beds, sun loungers, and infinity swimming pools with sunset views. Airy living spaces have en-suite bathrooms with indoor and outdoor showers, and outdoor soaking tubs, his and hers walk-in dressing rooms, and state-of-the-art conveniences include Bose Bluetooth surround-sound systems and iPads. A 24-hour Villa Host takes care of every need. Exuding elegance and charm with hardwood floors, high ceilings, and sophisticated island-inspired décor and furnishings with colorful accents, Over Water Pool Villas and Sunset Over Water Pool Villas are 267 square meters in size with private sundecks with hammocks and sun loungers, infinity swimming pools with floating loungers, and outdoor bathrooms with showers and glass-floored outdoor baths. Villas have direct ocean access from sundecks, and a wealth of modern amenities such as an in-villa mobile phone, a state-of-the-art Bose sound system, a selection of board games and reading materials, and a 24-hour Villa Host takes care of every need. Boasting generous spaces perfect for a family getaway, Family Beach Pool Villas are 412 square meters in size and feature private outdoor dining pavilions for alfresco dining, two en-suite bathrooms with indoor and outdoor showers, sundecks with infinity swimming pools and sun loungers, and modern amenities such as board games and iPod docking stations. 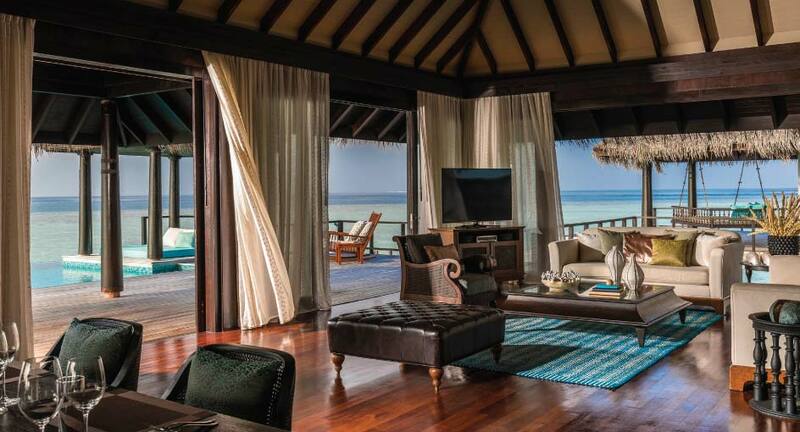 A 24-hour Villa Host takes care of every need. Redefining space and exclusivity, Two Bedroom Beach Pool Residences are ideal for families and friends to holiday with more than 786 square meters of space, palm-fringed outdoor areas, en-suite bathrooms with indoor and outdoor rain showers, and sundecks with infinity swimming pools and sun loungers. Quiet retreat steps from the water’s edges, these residences have direct access to a private stretch of beach, and the services of a 24-hour butler to take care of every need. Island oases that truly reflect their spectacular surroundings, Two Bedroom Over Water Pool Residences are stylishly designed over water sanctuaries with outdoor lounging areas and large bathrooms with indoor and outdoor showers and baths. Featuring 872 square meters of space, villas have fully equipped kitchens for private catering, over-water dining salas with glass floors, wine chillers with a selection of fine wines from around the world, and sundecks with infinity pools and over water hammocks. Sony PlayStations offers endless entertainment, and a 24-hour Villa Host takes care of every need. Pinnacles of beachside living, Three Bedroom Beach Residences are the ultimate private haven for families or small groups. Boasting modern interiors with classic Maldivian charm, these spacious retreats have over 2,700 square meters of stylish space with living rooms and fully equipped kitchens, shaded dining salas and private outdoor spas, infinity swimming pools and sun decks with loungers and daybeds, secluded gardens, a daily turndown service, and a 24-hour butler service. The ultimate in luxurious beachside havens for families and group of friends, Four Bedroom Beach Pool Residences boast nearly 3,000 square meters of space with two infinity swimming pools and vast sundecks, loungers, umbrellas and hammocks, private outdoor dining salas and fully equipped kitchens. Sumptuously designed bedrooms have en-suite bathrooms with outdoor Jacuzzis and showers, lush gardens and direct beach access, barbecue stations and in-suite bars with dedicated wine chillers stocked with fine wines from around the world, and a 24-hour Villa Host takes care of every need. 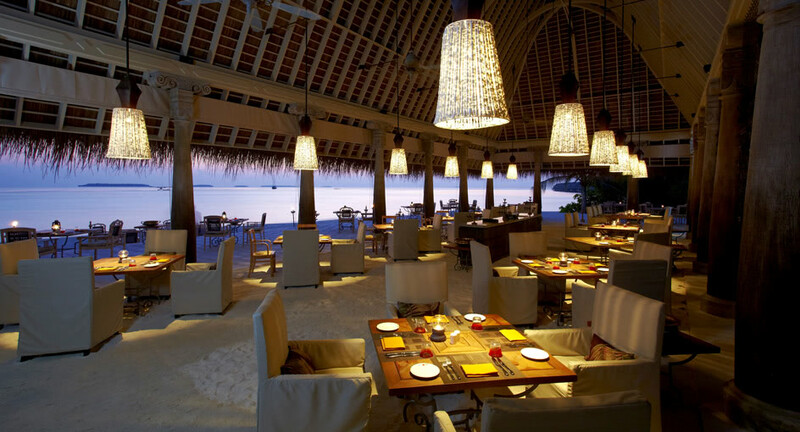 Savor exciting gastronomy in a private island paradise, from extraordinary perspectives. 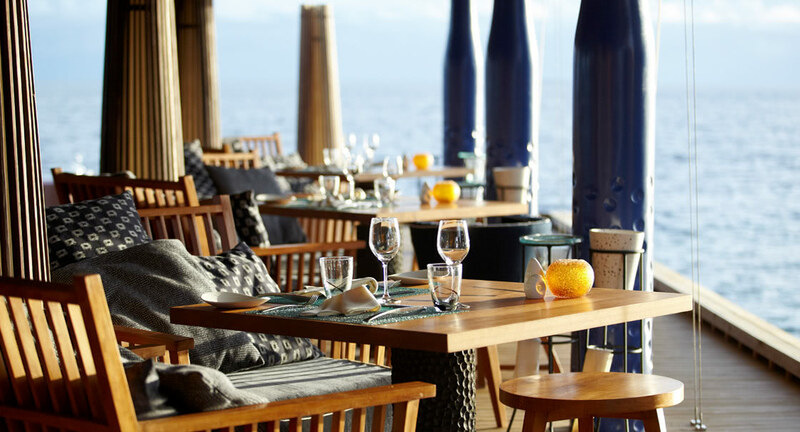 Discover one-of-a-kind dining – under and perched over the ocean, on a powdery beach and boasting a rooftop panorama. Immerse in an exotic destination with the freshest seafood, tropical sunset cocktails and lively Maldivian cooking classes. Feel good with holistic wellness cuisine, indulge in a romantic tailored dinner, or expand horizons with wine tasting and stargazing journeys. Discover a gourmet paradise with surreal ocean viewing at SEA. 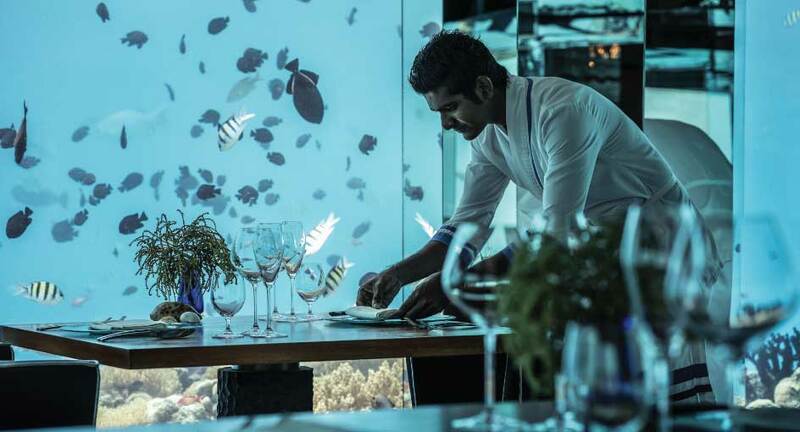 The world’s first underwater wine cellar and restaurant entice with flawless degustation menus for lunch and dinner where guests can relish chef’s connoisseur creations paired with a range of wines spanning nine decades, orchestrated by a professional Wine Guru. 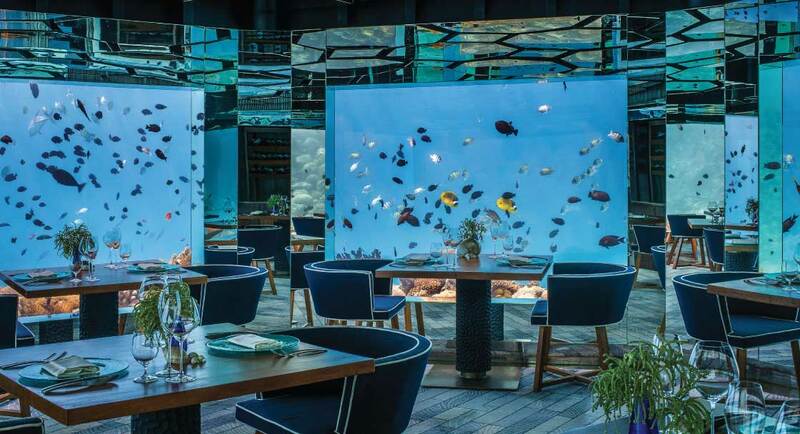 Soak up the dazzling marine life swimming peacefully beyond the curved glass wall while savoring award-winning cuisine. Discover celebrated recipes from Thailand, Vietnam, India, Indonesia, and China with spice and herb-laced salads and appetizers, wok-tossed rice and noodle favorites, or creamy and spicy curries at SALT. Indulge in tender meats and fresh seafood, cooked to perfection on a Himalayan salt block for a unique depth and complexity of flavor. 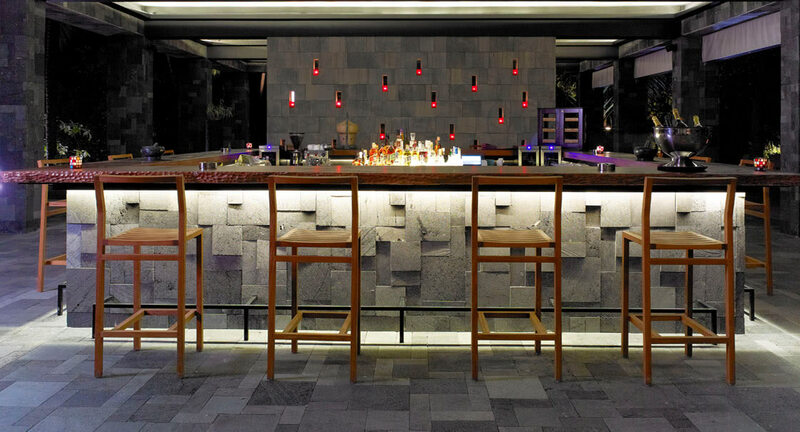 Watch the open air kitchen sizzle with activity as the Salt Sommelier pairs meals with the ideal seasoning from a gourmet salt selection. Dinners fire up Japanese theatrical flair in an ambient over water setting where guests can marvel at the acrobatic cooking skills of talented chefs on their culinary stage at FIRE. Begin with signature sushi and sashimi followed by prime Wagyu steaks, seafood plucked from local waters and flown in fresh from all over the world, and lobster from the cage to be sizzled on the Teppanyaki grill. Feast on special set menus and end with intriguing Japanese desserts. 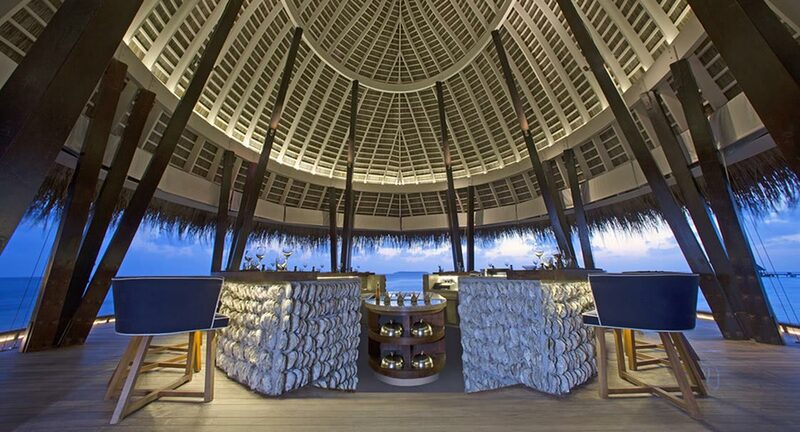 Experience the wondrous galaxy above in a lounge bar and over water observatory open to the sky. Home to Maldives’ most powerful telescope, SKY invites guests to experience stargazing sessions with the SKY Guru who will reveal the mysteries of the stars, planets, and constellations that glitter overhead, in a paradise free from light pollution. Gather at the bar or relax on loungers beside one of the longest pools in the Maldives at Manzara where lunch is a zesty Mediterranean affair of colorful salads, stuffed focaccia, crispy pizza, fresh pasta and juicy steaks and Evenings bring Italian elegance. Choose from a delicious menu of antipasti delights, artisan pasta and risotto creations, fresh seafood and succulent meat specialties, enhanced by Mediterranean olive oils. Linger over fine wines and classic rich desserts. Breakfast by the beach at Plates energizes with healthy light yogurts and tropical fruits, spicy indigenous specialties and wellness options such as fresh vegetables and detox juices. Wake up to the sound of the waves, refreshed by probiotic superfood smoothies, revitalizing fruit juices and freshly brewed coffee. Enjoy unique buffet themes on two nights of the week with alfresco dining on the beach when weather permits. Wednesdays present an excellent spread of fresh organic salads, Maldivian seafood and BBQ meats with the Jazz Night Buffet. Sunday nights celebrate a decadent pairing of diverse lobster specialties and Champagnes. Descend into a surreal connoisseur journey at SEA – one of the few underwater wine cellars and restaurants in the world and taste your way through a vast selection of 450 labels from 23 countries, including rare and vintage bottles, expertly chosen by the resort’s accomplished Wine Guru. Blend romance and gastronomy with an ultimate private dining experience by collaborating with a personal chef to craft an exquisite menu. 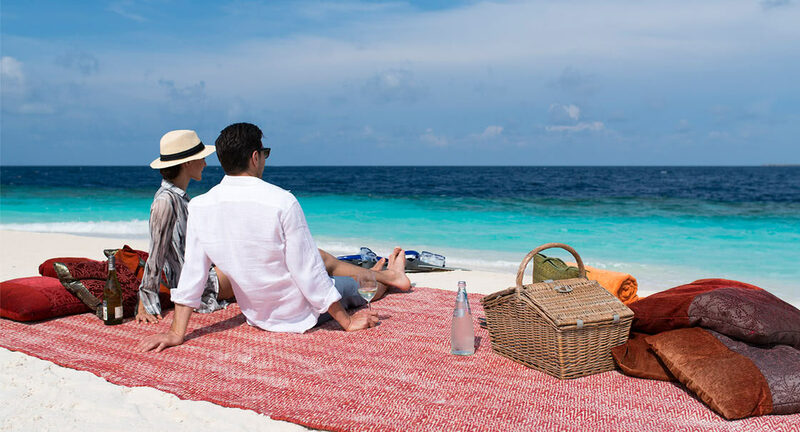 Escape to a deserted sandbank in the Indian Ocean for lunch and toast a mesmerizing sunset in shoreline intimacy. Dine under the stars on the deck of a private yacht or hide away in luxurious villa seclusion where a personal butler tends to every need for an unforgettable occasion. 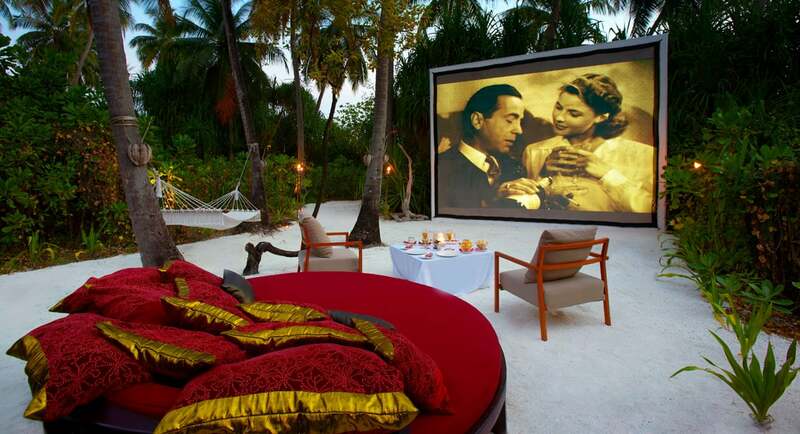 Recline under a tranquil Maldivian sky and enjoy classic movies on a big screen under the stars. Indulge on oysters and Champagne to watch Casablanca, nachos with guacamole for Don Quixote, or a bucket of chicken wings for Top Gun. Private in-villa dining is available 24 hours a day, where chefs prepare favorite meals from a handcrafted menu for family affairs or romantic dinners for two. 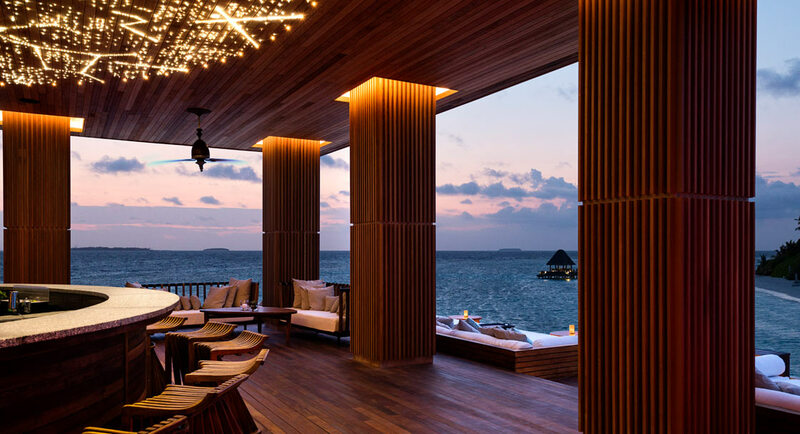 Surrender to relaxation with outstanding ocean views at the Anantara Kihavah Maldives Villas luxury over-water spa with a wealth of invigorating natural rituals, massages, body treatments, and healing therapies. 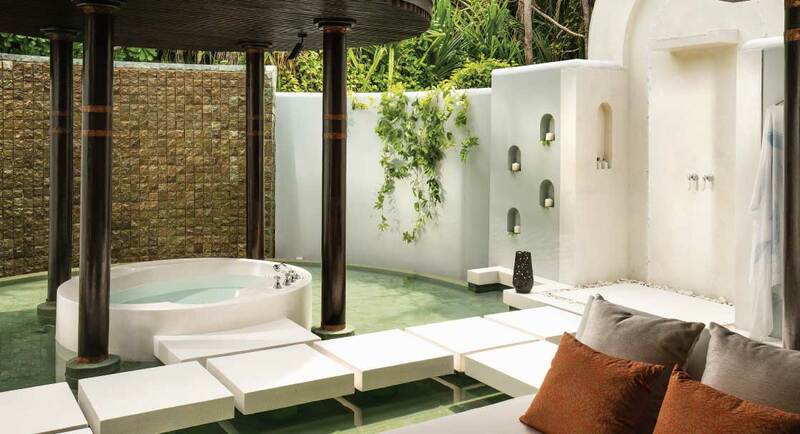 The spa features six over-water treatment suites, a manicure, pedicure and hair salon, indoor and outdoor showers, a steam room and sauna, expansive over-water pre- and post-treatment spaces, a relaxation deck with cold plunge pool, and a Shirodhara Bed. 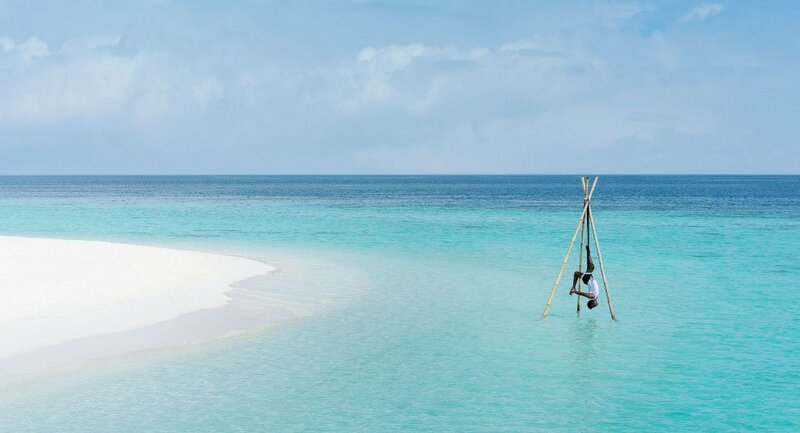 Anantara Kihavah Maldives Villas offers an array of outdoor activities, health and fitness programs, and land and water sports for guests to enjoy. 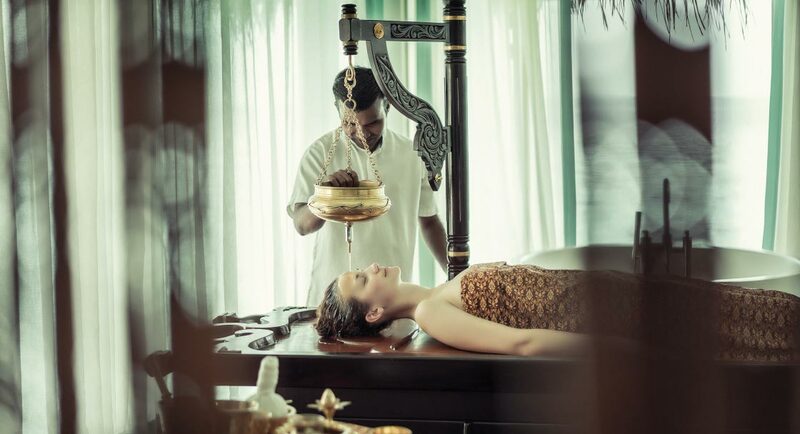 Make a healthy change with Anantara’s innovative wellness concept, Balance or pursue a healthier life with a variety of wellness boosts and healing therapies. A team of expert practitioners offers private consultations and treatments, including Ayurvedic treatments, yoga sessions, tennis lessons, and gym programs. 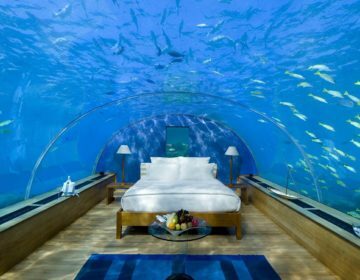 Hailed as one of the top resorts in the world for unrivaled diving and snorkeling, Anantara Kihavah Maldives Villas is renowned for the incredible density of marine life that can be found on the resort’s house reef and offers scuba diving and snorkeling experiences second to none. The resort is not only home to a pristine house reef, which can be described as a reef that is close to the shore of the island and easily accessible but also has a professional team of divers with a resident marine biologist who is on hand year-round to take diving and snorkeling experiences to another level. 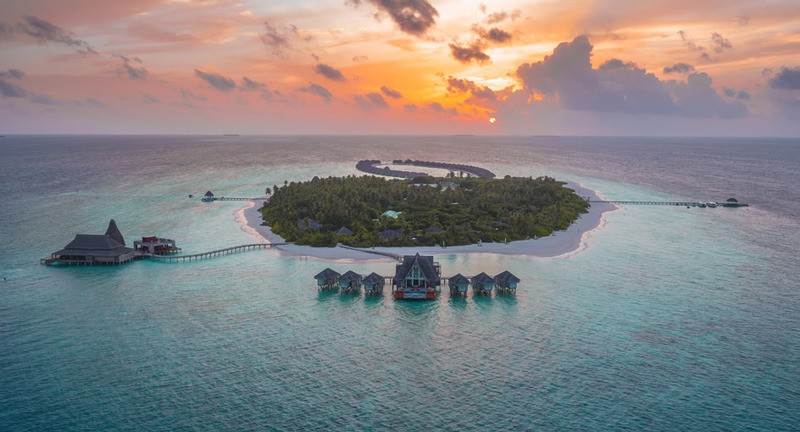 Set within a UNESCO World Biosphere Reserve, the waters around Anantara Kihavah Maldives Villas resort boast an abundance of pristine reefs and brightly colored corals that teem with life. Turtles, eels, reef sharks, nurse sharks, and a wealth of small and large fish of unimaginable hues call these naturally formed marine sanctuaries home, while just off the reef drop-off and slightly further offshore, there are dolphins, manta rays, eagle rays, stingrays, turtles, and behemoth whale sharks. Anantara Kihavah Maldives Villas’ Dive Centre offers a variety of dive and snorkeling-related services for guests who want to make the most of the spectacular surroundings. The center provides a range of PADI diving course from certification courses for beginner divers to Rescue Diver for scuba experts, orientation dives with certified instructors, and a unique Coral Adoption Program, a long-term plan designed accelerate the regeneration of coral growth in the atoll reef to ensure the future of this incredible Maldivian destination. Say “I do” in one of four breathtaking settings surrounded by natural romance at Anantara Kihavah Maldives Villas with a distinctive ceremony or milestone anniversary. Whether you set sail into the sunset to say your vows onboard a luxury yacht, enjoy a beach ceremony against a backdrop of spectacular ocean views, or dive into the deep blue for a unique marital adventure, the professional wedding planning team at Anantara Kihavah Maldives Villas will take care of every detail from start to finish with a variety of packages from which to choose. 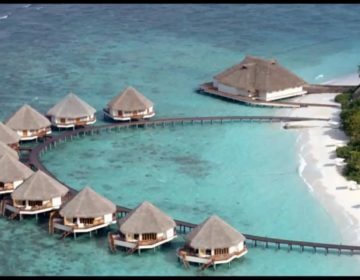 Coral reefs protect the pristine beaches at Anantara Dhigu, Anantara Veli, and Naladhu Maldives and guard the islands’ crystal-clear lagoon. They also support an astounding array of tropical fish, crustaceans, and bizarre-looking mollusks. 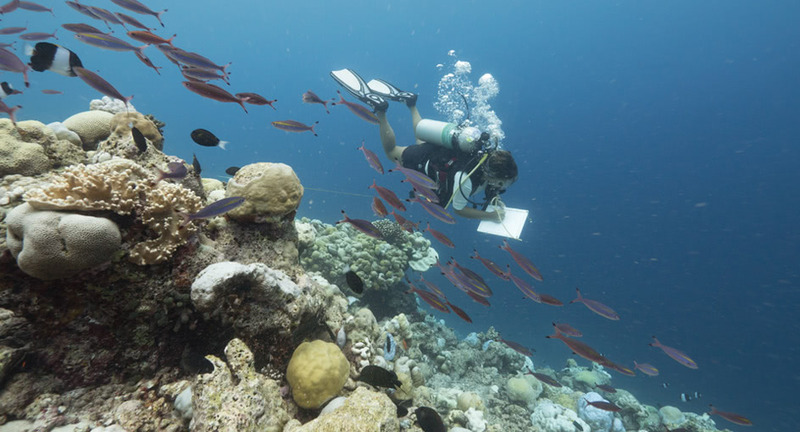 Anantara Kihavah Maldives Villas initiated the Coral Adoption Program, which invites guests to participate in this long-term project, whereby they plant coral in the resort’s reef nursery and follow its growth with photo updates or return visits. 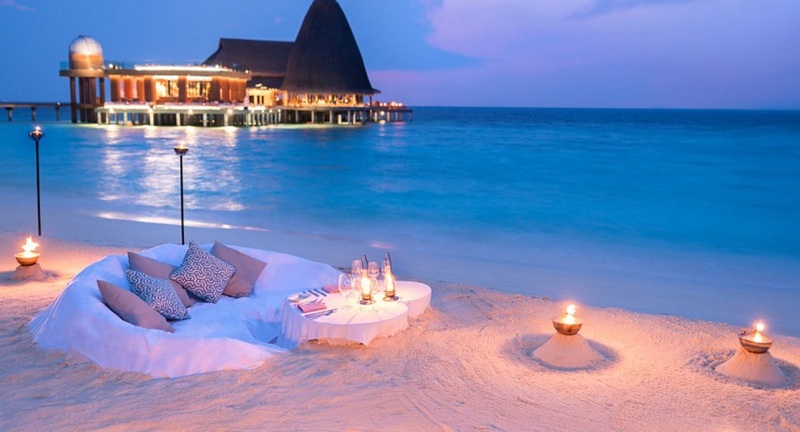 Why Anantara Kihavah Maldives Villas? To experience all that this spectacular resort has to offer, click here to book.